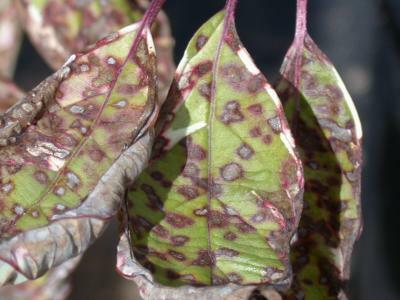 Septoria leaf spot on dogwood. Septoria leaf spot is a fungal disease of tomato caused by Septoria lycopersici. While the disease can appear on tomato leaf petioles, stems, blossoms, and flower stalks, it most commonly is found on the lower leaves. Symptoms first appear as tiny, water-soaked areas but soon enlarge to form circular or angular lesions about 1/8 to 1/4 inch in diameter. Mature lesions have a dark margin with a grayish white center that contains tiny, black fruiting (spore-producing) bodies. Heavily diseased leaves turn yellow, wither, and drop in large numbers, starting at the base of the plant. The fungus survives in infected plant debris left on the soil surface or buried in the soil. Under favorable conditions in the spring, the fungus produces spores that are carried by wind and splashing rain. Secondary disease cycles can occur as long as the weather remains favorable. Infection and subsequent defoliation can be severe during prolonged periods of warm, wet weather. Crop rotation and clean tillage (for example, plowing) help reduce the risk of disease by reducing the amount of primary inoculum (spores) in the immediate area. Tomato varieties susceptible to wilt diseases may be more prone to leaf spots. Apply recommended fungicides when conditions favor disease.